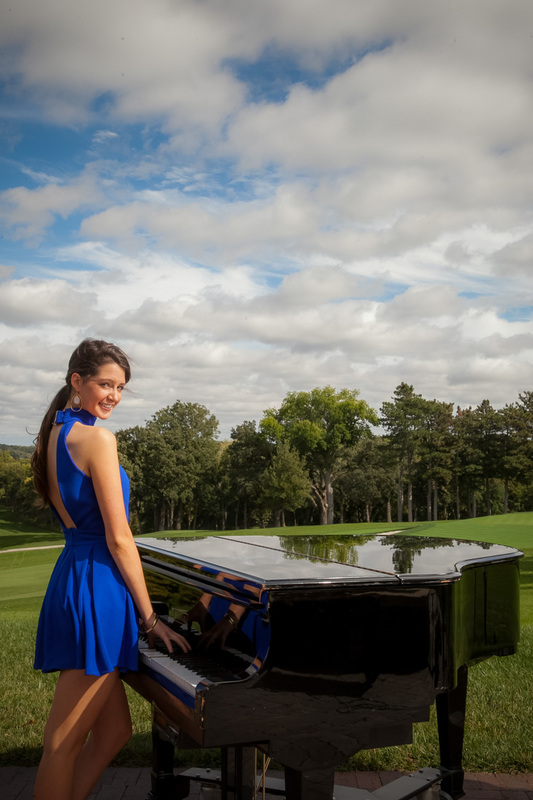 The best senior photography can only happen when combining the ever talented Shelby with the Omaha Country Club. We were out on the golf course throughout her senior photography session. With camera and lights in hand, it was the most perfect early fall day for Shelby’s senior photos. When the temperatures in Nebraska hover at between a mild seventy degrees and we have the crisp blue skies and cirrus clouds, I can definitely spend an entire day making photo sessions sing. Speaking of singing, we managed to wheel out the grand piano with an amazing overview of the course as a backdrop. How can you top a piano outside with the most beautiful senior model. Shelby even keyed a short tune that made me want to sing but that would definitely not have been a pretty sight. Beyond that, it just doesn’t get any better than riding on the golf cart selecting prime locations. Even with the pro golfers holding us at bay as they moved past us on the green, we still managed to sneak in to several prime photo locations. If I ever have the free time to gain membership to a golf course, I’m bringing my camera along. Its not only scenic, but extremely peaceful and a great challenge. These are the ideal conditions for a landscape photographer. Shelby added fun and brought along her own favorite sister and little teddy bear too. It is no surprise after getting to know her, that she is also an artist, and thinks creative ideas for her photos . I never want to limit what a high school senior wants to add to their portrait session, including family portraits, pet photography or any aspects of their past that shaped their life to where they’re at today. This was the ideal plan for the best senior photography session.